Doesn’t it seem like that just happened!?!?! It sure does to me, but it’s been more than a year since I sold Skype. She’s gone on to bigger and better things and is one of the best 2-year-old fillies in Puerto Rico. She won her first four starts, including the Clasico Eduardo Cautino Insua Stakes (Grade III). In her fifth start, she ran a good race, but just ran out of ground and finished second in an allowance. In her most recent start, she ran very well, but was just second best in the Clasico Dia de la Raza Stakes (GII). Overall, her career record stands at 4-2-0 from six starts and earnings of $62,698. Not too shabby! Since Skype’s sale, Sky’s only other foal, Sky Above, has also gotten in on the action. A 3-year-old gelding by Artie Schiller, Sky Above won his career debut in a maiden special weight at Presque Isle Downs by a widening 10 lengths. He followed up that effort with a strong runner-up finish in an allowance race. His first two races were on a synthetic surface, but his third start came on turf and he was off the board. He’s bred to like the turf so maybe he just had an off day. Anyway, the point is that Sky has two foals of racing age and they are both debut winners and have a combined record of 5-3-0 from nine career starts with earnings of just shy of $100,000. Sky Above sold at the 2010 Keeneland September sale and, as I wrote previously, Skype went through the ring at the 2011 Keeneland September sale. Well now it’s time for Faith to strut her stuff. It’s unbelievable, but “little Faith” (as I called her when she was a foal, but she’s anything but little now) will sell on Tuesday at the Fasig-Tipton Kentucky Fall Yearlings sale. You can view her catalog page at http://www.fasigtipton.com/catalogs/2012/1022/468.pdf. I hate to use the “it seems like yesterday” cliche, but when I think about the day Faith was born, it really does seem like yesterday! Heck, I remember the day she was bred to Parading like it was yesterday. She was covered on March 6, 2010 while I was dancing away at UK’s 24 hour dance marathon known as DanceBlue. The next video was taken last week on her final day at Trackside Farm before moving to the sales grounds. She’s grown up just a tad. I couldn’t be happier with how Faith has grown up and come along. She is a beautiful chestnut filly with great conformation and a fantastic walk. I’m also happy to say that her x-ray report came back perfect. Faith has all the makings of a great racehorse and I truly believe that is what she will become. This isn’t an easy game. The last two years have not been all blue skies and rainbows, but there are three things that have gotten me through the hard times: Faith, hope, and love. The Thoroughbred industry is a game built on HOPE. Every trainer and owner “hope” they have a Derby or Oaks prospect (or if you’re my dad, you hope you have a Travers or Alabama prospect), every breeder and consignor “hopes” to sell a horse someday for six or seven figures, every jockey “hopes” to get a mount that will change their lives…the list goes on. Everyone in this game is hopeful that something great is in one of their stalls in the barn. I’m no different. And the hopes and dreams of breeding a major stakes winner keep me going through the rough patches. The new filly will be nicknamed Faith. After the Green Bay Packers won the Super Bowl, Packers’ wide receiver Greg Jennings was interviewed on the field. During the interview he repeated the phrase, “To God be the glory.” I remember watching it live and thought it was really cool that Jennings remembered to give praise to God. Many athletes say, “I’m going to Disney World,” after winning a championship, but not Jennings. His words inspired me to go with a name that had a Biblical connection. Faith, hope, and love. They were all finalists for the nickname of the new foal. Then I began to think about each one a little more. I have a lot of hope in my life. I wrote a blog post a couple of months ago about the entire Thoroughbred industry being built on hope. I have hopes and dreams for my personal life and my career. I have a ton of love in my life. I have the most supportive family in the entire world that loves me more than I can even understand. I have many close friends that love me. I also have a God that loves me and looks after me. Now we move on to faith. I am less than three months from graduating and my future is still uncertain. Sometimes I lose sleep at night thinking about where I will be in a year. I have three horses that I have very high hopes for, but I know that this sport is one of the toughest in the world. It has the highest of highs and the lowest of lows. I can hope all I want, but that doesn’t mean my hopes will come true. What I need most in my life is faith. It’s taken a lot of faith to get through the time of Faith’s foaling to this sale. But she has given me more happiness and joy than I could have ever imagined and, obviously, she has given me a lot of faith. Faith that she’s going to go on to bigger and better things, better than her siblings, better than her mom, and who knows, maybe even better than her dad. I’ve got Faith. Now it’s time for someone else to have it. Just wanted to let the readers know the results from DanceBlue 2011. UK’s 24-hour no-sitting, no-sleeping dance marathon raised $673,976.60 for the Golden Matrix Fund! It was a record-setting number for the marathon that began in 2006. It was my fourth and final year as a dancer and it was the best year yet. 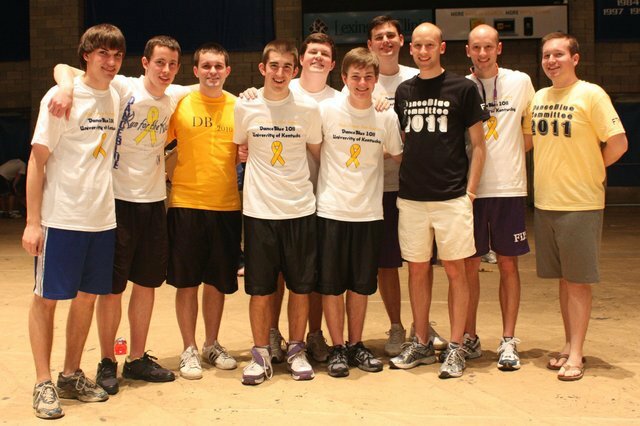 The four DanceBlue weekends I participated in are four of the best weekends of my college career. Thank you to everyone that supported me throughout the marathon. Your words of encouragement made it a lot easier. Below is a picture of my DanceBlue team (Phi Gamma Delta), as well as a video of the money raised reveal and final line dance. This will be my fourth year as a dancer at DanceBlue. I remember my first time dancing at the marathon in 2008. It was such an amazing and rewarding experience that I promised myself I would dance every year until I graduated. Well, I am going to graduate in May and I am happy to know that I was able to be a part of this incredible philanthropy for four years. So…from 8 PM on Friday night to 8 PM on Saturday night, I will be dancing at Memorial Coliseum with 700 other UK students; raising money and awareness for the UK Pediatric Oncology Department and the Markey Cancer Center. Twenty-four hours of no-sleeping and no-sitting all FOR THE KIDS. If you would like to learn more about UK’s DanceBlue, you can visit the website at www.danceblue.org. Also, if you would like to make a donation to DanceBlue then you may click the following link: https://giveto.uky.edu/DB_p/db.htm. The donation page requires you to select a team to support with your donation. If you would like to support my team, then select Phi Gamma Delta. Any donation is much appreciated. Finally, if you’re in Lexington (or not too far away), I suggest that you try to visit Memorial Coliseum to see DanceBlue in person. It really is quite the event. The final DanceBlue line dance and money raised “reveal” will be at about 7:45 PM on Saturday night. You can watch last year’s final line dance and reveal below. And in case you can’t see the signs clearly enough, last year DanceBlue raised $636,638.58!!! I would first like to thank Bloodstock in the Bluegrass and Equidaily.com for linking my blog on their sites last week. This blog had its highest weekly view total in five months and that would not have happened had my posts not been linked on the previously stated sites. Last week I also started my last semester as an undergraduate. I remember when I graduated from high school that my projected college graduation date of May 2011 seemed very far away; however, the time has FLOWN BY and I will graduate in less than four months. For those of you that may be interested, my course schedule is listed below. I am taking this class as an upper-level elective. I believe that it may be very helpful in preparing me for a career in the greatest sport in the world: horse racing. I am really looking forward to this class. The topics that will be discussed include legal issues with stallion contracts, partnerships, horse ownership, wagering, public auctions, private sales, etc. The class is being taught by Walt Robertson’s son, Walt Robertson, Jr., who practices equine law in Lexington, KY. I am taking this class to complete my minor in Agricultural Economics. The class will discuss the agricultural futures and options markets. The course title is pretty self-explanatory. I am required to take this class by my major, but it could be interesting. It will also be the last “math class” that I ever take. This is the capstone class for my major, Equine Management. The class will be centered around discussion of issues in the horse industry. There is also a group project that will be worth most of my grade. The project must analyze the various costs of owning and raising a Thoroughbred; I think I can handle that after this past year. On a side note, it has the fewest number of students of any class that I have taken during my time at UK; there are only eight students, including myself. It is also interesting to note that I am the only guy in the class, further displaying that the Equine Management major is one of the most female-dominated majors at UK (I believe it is close to 90% female). What will I do when the above classes end and I graduate? Well that is still up in the air. I have almost completed my application for the MBA program at UK and I take the GMAT (Graduate Management Admission Test) this Saturday. I am hopeful that I get accepted to graduate school so that it will be an option upon graduation. I am also beginning the job hunt and hope to get a couple of job offers before May. I am trying to get myself as many options as possible. After a three race losing streak, my good friend Charlie (Usain Again) will drop back into the claiming ranks after six straight races at the starter allowance level. Charlie will run in the fourth race at Gulfstream Park in a $12,500 claimer. I haven’t had a chance to look at the past performances for the race, but apparently Charlie has a shot as he is 6/1 on the morning line. Good luck to Charlie and all of his connections! Finally, I would like to make a comment about Monday’s Eclipse Awards Show. Here it is: it was dreadful. The show had about as much excitement as a middle-school sport’s team’s awards program. I turned on the Eclipse Awards in my living room and within a couple of minutes my roommates were begging me to change the channel because it was “so boring.” Boring should never be a word used to describe a large-scaled event in the horse racing industry. The show wasn’t just boring for my generation and I know this because I’ve spoken to some people from the “baby-boomer generation” that also found it painful to watch. It’s the most exciting sport in the world and the awards show may be the most boring in the world. A lot needs to change for next year’s show, but for starters, there needs to be a “big-name” star to host the show (with a stand-up routine that will actually get some laughs), some sort of musical performance, award presenters that aren’t stiff as a board, and a time-limit to acceptance speeches. I pray that next year’s show is better and that I will be able to stay awake to make it to the Horse of the Year presentation. That is all for now as I am headed off to class. Have a great rest of the week! I wanted to share my final paper in my English class with the blog’s readers. It is a proposal for changes in the Kentucky Thoroughbred industry. Please be aware that the paper was limited to 5 pages and so I was unable to go in-depth on many issues and had to leave a lot of stuff out. Trying to write a detailed report on what needs to change in the Kentucky Thoroughbred industry in less than five pages is pretty much impossible, so I did the best I could. Also note that I was writing for an audience that was not familiar with Thoroughbred racing. Another problem is that I could not get the graphs and charts to show up, so please disregard the parts when I mention them. Anyway, the paper is below. I appreciate any comments. Thanks and hope everyone had a great Christmas. The state of Kentucky is rightfully known throughout the world for bourbon, basketball, and Thoroughbreds. The Kentucky Distillers’ Association estimates that 95% of the world’s bourbon is made in Kentucky and the University of Kentucky men’s basketball team is the winningest program in college basketball history. Two of the three trademark industries of Kentucky appear to be continuing their success and have bright futures. Unfortunately, the same cannot be said about the state’s Thoroughbred industry. Money wagered on races, track attendance, television ratings, and foal crop numbers have all been declining rapidly over the past couple of years. The Thoroughbred industry is far too important to Kentucky for leaders to allow it to disappear, but that is what will happen if action is not taken. According to the Kentucky Horse Council, the Thoroughbred industry provides 40,000 jobs in the state and has an overall economic impact of close to two billion dollars. The economic impact of the Kentucky Derby alone accounts for nearly one-quarter of a billion dollars. Changes in Kentucky’s Thoroughbred industry are necessary and vital to its survival. The Kentucky Thoroughbred industry will remain one of the state’s most important and successful industries and experience improvements in handle (money wagered), attendance, and television ratings if the following proposed changes are implemented in the racing and breeding sectors of the industry. The leaders of Kentucky racing, specifically Keeneland and Churchill Downs, must increase new client recruitment and development, improve client retention, and increase lobbying for expanded gaming legislation. The breeding industry leaders, this being major stallion farms, members of the Kentucky Thoroughbred Development Fund, and the members of the Kentucky Breeders’ Incentive Fund, must work in collaboration to lower stud fees and improve the state’s breeder rewards program to be competitive with other states. Kentucky’s Thoroughbred racing industry is desperate for new clients; i.e. fans and owners. The state’s two most important racetracks, Keeneland and Churchill Downs, must lead the way on implementing programs to recruit more fans and owners. The first task is to get people to the track and allow them to experience the joy and excitement of Thoroughbred racing in Kentucky. One of the easiest ways to get people to the track is with promotional days; such as Keeneland’s College Scholarship Day and Churchill Downs’ Night Racing. Keeneland’s College Scholarship Day occurs once per racing meet and offers free admission, free food, and live music to college students. The most recent College Scholarship Day attracted almost 3,400 students. Most of the students in attendance were students at Kentucky colleges and universities; however, the event also attracted students studying outside of Kentucky. Many of Kentucky’s Thoroughbred industry issues are causing fans and owners to leave the state; however, this event brought fans into the state. Churchill Downs’ Night Racing program features “prime-time racing” under the newly-installed lighting system. Churchill Downs held its final night racing program of the year last month and close to 16,000 people were in attendance. This number triples the attendance for an afternoon program on the same day in 2009. Obviously, these promotional days have been accomplishing their task of bringing new faces to the racetrack. Keeneland and Churchill Downs have done a herculean job of getting potential fans to the track; however, improvements must be made to keep the potential fan entertained during their visit. First impressions are everything and if a potential fan has a bad first experience at a racetrack, he/she is extremely unlikely to return. A good place to start on changes is pricing. Keeneland and Churchill Downs must cut their prices for parking, food, beverages, and souvenirs. A person going to Churchill Downs or Keeneland may pay $10 to park, $5 for admission, $7 for a sandwich, $3 for a drink, and $25 for a souvenir t-shirt. This person has already spent $50 and has not even placed a bet yet. Parking should be free, souvenirs should be cheap, and food and beverage prices should be more reasonable. In an effort to attract fans, many harness tracks, including Lexington’s The Red Mile, offer free admission and parking along with inexpensive food and beverages. The state’s Thoroughbred tracks should follow The Red Mile’s lead. Lower prices will encourage potential fans to make a few wagers throughout the afternoon; however, high prices will keep them away from the betting windows. No one should ever walkout of the racetrack and say, “I’m not coming back; it was too expensive.” Thoroughbred racing must be a cost leader in the live-sports entertainment industry. Another area for improvement is customer appreciation. This will help recruit and develop new fans and also improve current client retention. Horse racing is known as the “Sport of Kings” and fans should be treated as kings while at the racetrack. Unfortunately, fans are treated as anything but kings while at racetracks. Frank Mitchell, author of several books on horse racing and owner of The Croft Thoroughbred farm, noted that Kentucky racetracks “don’t seem to recognize that their job is to make sure fans have a great time.” Customer appreciation can be improved with more comfortable seating, knowledgeable and courteous employees, cleaner facilities, and complimentary items to all guests. It is important to note that not all people attending the races will become fans, but enough will to keep the industry successful. Also, all owners were once “only” fans and then decided to take their love of the game to another level. The industry is in need of new owners and maybe a few people will leave a track after their first visit with the desire to own a racehorse. The Thoroughbred racing industry needs more fans and therefore cannot afford to lose any current fans. Fortunately, racetrack leaders can “kill two birds with one stone” when it comes to client recruitment and client retention. Several of the improvements that racetracks must make in order to attract new fans will also retain the current fans. Making the customer feel appreciated is extremely important and feeling appreciated matters to all fans. There are a couple of improvements that can be made to retain current fans of racing; including frequent player rewards programs and decreased takeout. A frequent player reward program would reward fans for regularly betting on the live racing. There would need to be different player levels based on amount wagered by a person during a given period of time. Frequent players betting small amounts of money may be rewarded with free admission, free food, and free drinks. The “high-rollers” may be rewarded with Kentucky Derby tickets or a free VIP suite for the afternoon. Also, a decrease in takeout would be appreciated by current racing fans and bettors. The takeout is a portion of all wagering pools that is taken by the track to cover a variety of expenses and provide profits for the racetrack. The current takeout in Kentucky is 16% for straight wagers and 19% for exotic wagers. These takeout percentages are some of the lowest in the country; however, they must decrease even further. According to the Horse Players Association of America’s president, Jeff Platt, “takeout percentages must be lowered to a level that is competitive with casinos. Most casinos only take out 2% of money wagered on table games and 9% for money wagered with slot machines. Lowering the takeout by a couple of percentage points would encourage fans to wager more money, make the takeout rate more competitive with casinos, and would display the racetracks’ knowledge that the bettor is the most important aspect of this industry. Current legislation in the state of Kentucky does not allow for expanded gaming (slot machines and casinos). Keeneland and Churchill Downs must lead the charge on lobbying for the legalization of expanded gaming in Kentucky. It is vital to the survival of our state’s beloved industry and would greatly improve the economic impact of the industry as well. Expanded gaming licenses have vastly improved the economic impact of the Thoroughbred industry in other states, especially Pennsylvania. In 2001, before expanded gaming was legalized, the economic impact of the Thoroughbred industry in Pennsylvania was $345 million, the industry employed about 6,500 people, and racing provided close to $7 million in taxes. In 2008, after a couple of years with expanded gaming, the economic impact of the Thoroughbred industry in Pennsylvania had risen to $1.6 billion, the industry employed over 23,000 people, and racing provided nearly $80 million in taxes (Pennsylvania Equine Coalition). The other states in the region that allow expanded gaming are Indiana and West Virginia. Similar situations are seen in these states, with massive increases in economic impact and people employed since legalizing expanding gaming. The revenue that is obtained through slot machines is going into the purses of the races in these states. The purses continue to grow and eventually Keeneland and Churchill Downs will not be able to compete with the purses at tracks in Indiana and West Virginia. This is already the case with Turfway Park and Ellis Park. Jennie Rees, journalist for the Courier-Journal in Louisville, noted that “Indiana, Pennsylvania, and West Virginia will continue to siphon off horses from Kentucky until expanded gaming is legalized.” Rees is spot-on with her analysis and the numbers are there to prove it. Figure 1 displays the number of Thoroughbred foals produced in the state of Kentucky for the past three years. Unfortunately, as the purses in Indiana, Pennsylvania, and West Virginia rise, the foal crops in Kentucky fall. More and more owners and breeders are moving their horses to states with expanded gaming to benefit from the larger purses. It is the responsibility of all people involved in the industry to help keep the industry alive in Kentucky, and that includes supporting lobbying efforts for expanded gaming legislation. The leaders of these lobbying efforts must be the most powerful and influential people in the industry; including, but not limited to, Keeneland’s president Nick Nicholson, Churchill Downs Incorporated president Robert Evans, Fasig-Tipton’s CEO and president Boyd T. Browning, Jr., Taylor Made Sales Agency’s president Duncan Taylor, Keeneland’s Director of Sales Geoffrey Russell, and Lane’s End president William Farish. The previously mentioned men are some of the most respected people in the industry and carry a great deal of power, as they operate some of the most successful companies in the Thoroughbred industry. Although they must lead the charge on lobbying for expanded gaming legislation it is every fan, owners, and breeder’s responsibility to help the cause. The bettor is the most important aspect of the Thoroughbred industry; however, the breeder is not far behind. The Thoroughbred breeding industry must also make changes and improvements; including, lowering stud fees and improving the state’s breeder incentive program. Both of these changes would improve the overall health of the industry and Kentucky and help prevent more owners and breeders from leaving Kentucky for nearby states that can offer big purses and fantastic breeder rewards programs with the revenue obtained with expanded gaming. Rob Whiteley, owner of Liberation Farm, wrote that “stallion owners are making less money, consignors are making less money, veterinarians are making less money, and breeders (the foundation for the other three) are experiencing heavy losses.” Many of these heavy losses are experienced due to incredibly high stud fees in Kentucky that do not reflect the current poor state of the Kentucky Thoroughbred industry. The average stud fee for stallions that will stand their first year at stud next year is about $9,000. This represents a 40% increase from the average stud fee for stallions standing their first season in 2010 (Blood-Horse). While all significant numbers in our industry our decreasing, stallion fees continue to rise. This is not right and must change. The biggest Thoroughbred yearling sale in the world is the Keeneland September Yearling Sale. Each year breeders bring their horses to sell and find out what their years of hard work and money is worth in the current market. The cost of getting a horse to the September Sale is significant and Whiteley estimates the cost at “between $60,000 and $70,000 to get a horse through the ring at Keeneland.” Whiteley took the $60,000 as a “break-even” price and analyzed the percentage of yearlings that sold at, or above, their break-even price. Figure 2 displays the results of Whiteley’s study throughout the 15 sessions of the sale. As is clear from the graph of Figure 2, breeders are taking a beating whether they are selling horses at the front of the sale or the back of the sale. Only about one-third of the “select” horses, horses chosen for outstanding pedigrees and conformation, sold above their break-even price. That is an awful percentage, but nowhere near as awful as the percentage for horses that sold in the later sessions of the sale. Only about 1 out of every 50 horses selling towards the end of the sale were able to bring their break-even price. The easiest way to decrease the break-even price and give breeders a better chance at turning a profit is to lower stud fees. Stud fees are one of the most expensive parts of yearling production and a reduction would greatly help Kentucky breeders. In the study conducted by Rob Whiteley, his figures included a $20,000 stud fee, seeing this as a “ballpark average.” Being that the stud fee is a fixed cost in yearling production, a lower stud fee lowers the “break-even” point by the same amount. Therefore, an average reduction of stud fees in Kentucky would give Kentucky breeders more of a fighting chance at breaking even in the tough climate of the Kentucky Thoroughbred market. For many breeders, breaking even is the goal; however, currently many breeders are experiencing big losses and it is only a matter of time before these breeders either move their operations to another state or get out of the industry entirely. It is time that the Kentucky Thoroughbred Development Fund’s members and the members of the Kentucky Breeders’ Incentive Fund come together to increase the breeder rewards program in Kentucky. The breeder rewards programs are so great in other states that one breeder of Thoroughbreds, who chose to remain anonymous, said, “I would be crazy to let a mare foal in Kentucky. There is nothing for me there.” The industry cannot survive without breeders because without breeders there are no horses. Money to increase the breeder rewards programs must be obtained, if not through expanded gaming, then through money from the state’s major sales companies and racetracks (Keeneland, Fasig-Tipton, and Churchill Downs). An extremely small percentage of money wagered at Kentucky racetracks goes into the breeder fund and this number should increase substantially, especially if expanded gaming is not legalized soon. Too many owners are leaving Kentucky to foal elsewhere. Figure 3 shows the percentage change in the percent of the United States foal crop from 1998 to 2008. The Kentucky Thoroughbred industry needs a lot of changes and improvements to return to greatness. Horses used to be the number one cash crop in Kentucky; however, last year they were overtaken by poultry. Unless industry leaders would like to live in a state known for bourbon, basketball, and chickens then these changes must be implemented as soon as possible. Enough time has already been wasted and this industry no longer has any time to waste. The task at hand is not an easy one; however, it can be accomplished through client recruitment and retention, expanded gaming legislation, decreased stud fees, and improvement of the state’s breeder rewards program. Winston Churchill once said, “There something about the outside of a horse that is good for the inside of a man.” The Thoroughbred industry means too much to too many people to let it disappear. Failure is not an option. Just an 1/8th of a Mile to Go! I just finished looking at all of my grades for the past semester. Many of my classmates consider the semester to be over when they complete their last final exam; however, I never consider the semester to be over until all of my grades are official. Well all of my grades are now official so the semester is over for me. Seven semesters down and just one more semester to go. I’m only an eighth of a mile away from college’s finish line. I know it will go by fast so I will use the time wisely. I plan on enjoying my last semester as an undergrad, but I will also be using the time to explore career opportunities and apply to a couple of graduate programs. I can see the finish line, but nothing beyond it. The horizon is foggy and I’m really unsure about what will happen once I cross the wire. Hopefully the view of my life post-undergrad will become more clear in the upcoming months. I’ll be sure to keep all of this blog’s readers posted. Lastly, I am currently on Christmas break and will be home in Louisville for the next couple of weeks. This means I will have the time to post on this blog more regularly, so be sure to check the blog frequently for updates. As always, thanks for stopping by the Reaching for Roses blog! Have a great afternoon. Yesterday my mom and dad came into Lexington to attend the University of Kentucky College of Agriculture’s scholarship luncheon with me. The luncheon was held to recognize students in the College of Agriculture that received scholarships this semester and to thank the donors of those scholarships. This year I was awarded the Dr. John T. Bryans Scholarship for the second year in a row. Dr. John T. Bryans spent 35 years working at the University of Kentucky’s Gluck Equine Research Center as a research specialist and professor of veterinary science. In 1990, he was one of the first inductees of the University of Kentucky Equine Research Hall of Fame. Dr. Bryans passed away five years ago and last year his daughters created the Dr. John T. Bryans Scholarship to guarantee that their father’s legacy would live on at the University. The scholarship is awarded annually to a student exemplifying high academic achievement in equine studies. Last year I was fortunate enough to be the inaugural recipient of the scholarship and I am so thankful to have received the scholarship again. The Dr. John T. Bryans scholarships have greatly assisted my family and me in paying for my college education. I am forever grateful to the Bryans family and I hope to make them proud. Yesterday I had my final advising conference with my academic adviser, Dr. Robert Coleman. I can still remember meeting with him to plan my first semester at UK and yesterday we planned my last semester. We began to discuss my future and I mentioned that I have an interest in pursuing a degree in law or obtaining a MBA. I am still unsure about exactly what it is that I want to do in the horse industry; however, I am leaning towards major racetrack or sales company management. Maybe one day I can be the director or assistant director of sales of Keeneland or Fasig-Tipton, or the president, vice-president, or CEO of Keeneland, Churchill Downs, or NYRA. To give myself the best chance of obtaining one of these positions, I believe that I need to further my education past college. What I must decide now is what post-graduate degree to pursue: law, MBA, or Master of Agricultural Economics. Right now, I am leaning towards pursuing a law degree and either a MBA or Master of Ag Econ. Also, I would love the opportunity to continue working in the Thoroughbred industry while I obtain these degrees. The dream would be to work full-time at Keeneland, Churchill Downs, or Fasig-Tipton and attend graduate school part-time at the University of Kentucky or University of Louisville. Obviously, the completion of multiple post-graduate degrees would take several years and a large amount of money; however, it may be worth it. Although I would be in debt, by age 30 I could have a MBA and a JD from UK or U of L to go along with my bachelor’s degree from UK. I believe that this would make me an attractive prospective employee to many companies, including several in the Thoroughbred racing and breeding industries. I would like to ask for input from the readers. If anyone has any suggestions for me, I would love to read them. All comments are greatly appreciated.